Along with our array of outdoor cleaning services we provide, of course, a decking cleaning service to compliment our already established cleaning range. A common issue with outside decking, is that it gathers dirt, debris along with becoming host to slime, moss and even weeds. This along with the debris makes it extremely hard to clean with the items at your disposal from your house, over time, the decking will become damaged, and could begin to rot which could lead to further problems down the line. When we begin the cleaning process of your decking you will instantly realise a difference, firstly the colour change you will notice, your decking will start to appear brand new very shortly after we begin. Due to our high powered pressure washing technology operated by our experienced pressure washing handlers, all debris will be removed, along with all moss and weeds, including algae, leaving your decking, clean and ready to be used for the up coming summer! before our operative leave we will thoroughly check over all decking, cleaning any parts that may have been missed and cleaning up all debris and dirt produced from the cleaning procedure, giving you piece of mind that no elements have been missed. Feel free to speak to our operatives during the job to ask how they’re getting on, they will be happy to run through you hat they have carried out so far! Once we have finished our cleaning service, we can run over the decking once again with our unique varnishing agent to protect the decking for an extended period of time against all forms of weather, climates and of course against, moss, algae and of course general use! 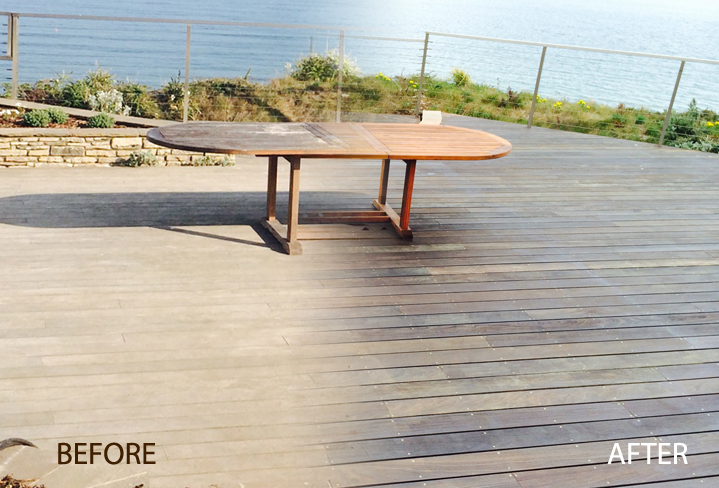 This effect is of course not visible to the naked eye, but the varnish itself will restore vibrant colour back into your decking creating a beautiful appearance you can be proud of. So what are you waiting for? Give OvenKing a call today on 01202 70 50 45 and speak to one of our jet washing specialists today and find out how we can help you!